Dimanche, Bart De Wever menace de faire tomber le gouvernement si Francken démissionne. Lundi, les autres partis modèrent leur langage. La suédoise est repartie. Mais le dossier soudanais n’est pas clos. Après la sortie de Bart De Wever dimanche soir, tout le monde a retrouvé ses esprits lundi matin. Pour Charles Michel, « la question de la migration et de l’asile mérite mieux que des querelles d’ego ». L'incident est clos! Pas si vite, c'est loin d'être terminé, l'opposition ne vas pas lâcher le nonos ainsi. La majorité est secouée, la confiance s'est évaporée de même que l'autorité de Charles Michel et 2018/2019 se profilent à l'horizon. "Carl Devos, a political commentator from the University of Ghent, told the Belgian newspaper Le Soir that the prime minister was in an impossible position. On est bien d'accord sur ce point. Affaire à suivre de très près. Belgium’s coalition government is at risk of collapse over a scandal involving the forced repatriation of 100 people to war-torn Sudan. The Belgian prime minister, Charles Michel, appeared on TV on Monday to insist he would not be intimidated by “blackmail or threats” after the Nieuw-Vlaamse Alliantie (N-VA), a Flemish nationalist party that is one of his three coalition partners, warned that it could withdraw support for his administration over the affair. The consequences of decisions taken by Theo Francken, a member of the N-VA and the minister for asylum and migration, are being examined following claims that some Sudanese migrants came to harm after he allowed three of the country’s officials to inspect their cases before they returned. Fears have been raised that Sudan’s government, led by Omar al-Bashir, was in effect allowed to handpick political opponents for repatriation from Europe. Bashir, who came to power in 1989 after a military coup, is wanted in The Hague over allegations of crimes against humanity. On Sunday, Bart De Wever, the N-VA leader, said he would rather bring down the government than allow such a senior representative of his party to be forced out. Michel has insisted that whatever the result of the inquiry, Francken’s resignation is not on the cards, prompting claims from the leader of the Socialist party in parliament, Ahmed Laaouej, that in Belgium “there is no longer a prime minister”. 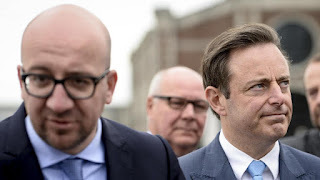 Eric Van Rompuy, a prominent member of the CD&V Flemish conservative party, which is also in the governing coalition, accused Michel of becoming “a puppet” of the N-VA.
Michel, 42, Belgium’s youngest prime minister, said there was no need for a change in administration. “The country is going well, and 2018 will be a better year than 2017,” Michel told the Belgian broadcaster Bel RTL. Carl Devos, a political commentator from the University of Ghent, told the Belgian newspaper Le Soir that the prime minister was in an impossible position.